Police arrested Mt Gox CEO Mark Karpeles today in Japan on allegations that he manipulated volume on the then-market leading bitcoin exchange platform prior to its 2014 collapse. The formal action from the Tokyo Metropolitan Police follows escalating reports this week that Karpeles was facing criminal charges for fraud and embezzlement, and comes more than a year after Mt Gox first filed for bankruptcy protection in the US and Japan. A report by The Wall Street Journal indicated Karpeles denied he was facing imminent arrest as early as Friday, calling accusations “false” and suggesting that he would deny formal charges. The news source stated that Karpeles has not yet been charged with any crimes, meaning he could be detained for up to 23 days before a formal charge without the possibility of bail. Other media outlets are reporting that the arrest took place at 6am local time. The exchange is currently undergoing a process of liquidation. Claims management is being conducted with the assistance of Payward Inc, the parent company of bitcoin exchange Kraken, which serves markets in Europe and Japan. At the time of its insolvency, Mt Gox was alleged to have lost as much as 744,4000 BTC or $350m in customer funds. Though part of this amount has been recovered, independent reports produced in conjunction with the policy investigation in Japan suggest the exchange had in fact lost much of its funds prior to its collapse. 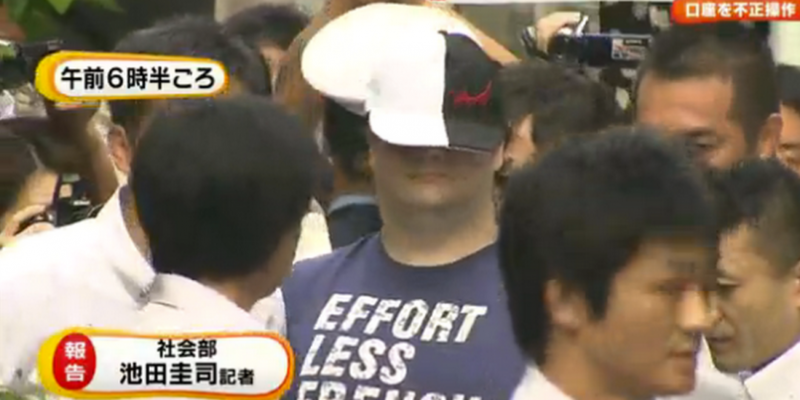 Video footage of the arrest can be found via Japan-based news source NHK.